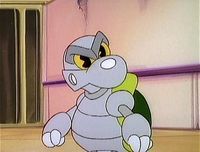 Robo Troopas are robots that are modeled after Koopa Troopas. Little is known about them, as they only made a few brief appearances in The Super Mario Bros. Super Show! episode "Robo Koopa". Their voices are identical to those of natural Koopa Troopas. Two Robo Troopas are ordered by Robo Koopa to guard Dr. Nerdnick's workshop in Robo Land, where Dr. Nerdnick is captured. When Mario and his friends come to rescue Dr. Nerdnick, Luigi accidentally catches the Robo Troopas' attention by getting knocked over. Before the Robo Troopas can attack, they are quickly defeated by Mario and Toad. Later on, a Robo Troopa makes another appearance, this time to alert Robo Koopa that Mario and Luigi have returned to fight him in their new Plumbinator suit. After King Koopa is exiled from Robo Land, the Robo Troopas are never seen again. This page was last edited on February 16, 2018, at 20:51.